Upgrading the client's existing lighting system with today's best-in-class energy efficient, green lighting technology while optimizing the return on investment. Maintaining your lighting solutions and managing warranties over the long term to reduce maintenance burden and maximize savings. 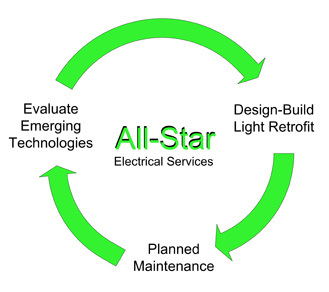 Evaluating emerging industrial lighting technology annually & recommending new cost-effective measures that keep the lighting system at peak efficiency. To provide turn-key, design-build energy efficient lighting solutions to the large commercial and industrial market with guaranteed savings and performance. Long term maintenance packages are available to all of our clients to ensure that the new lighting system functions optimally for the duration of its life, carries the best warranty, and ensures that group re-lamping occurs at the most efficient time intervals. 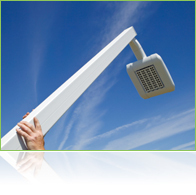 We manage our clients' lighting system and corresponding energy usage so they may concentrate on their core business. Our main goal is to provide our clients with a one of a kind service that will truly conform to their needs and budgets. 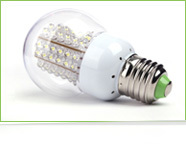 Financing available for your LED projects, including installation. We only use UL listed products.